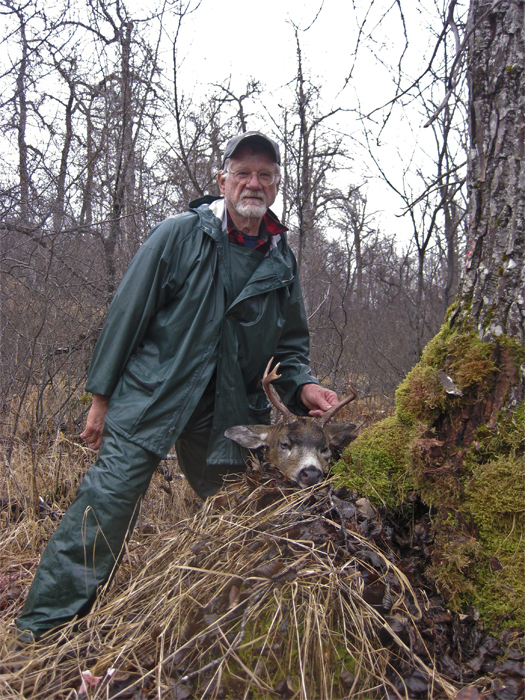 Introduction - For some 20+ years I have hunted deer on Kodiak Island, Uganik Lake, around the end of October. Since moving out of Alaska I have retuned to hunt with my two hunting partners Jim Finn and Jim Lavrakas, who I called J1 and J2. This year was different; Jim Finn was killed in an automobile accident last summer. J2 and I decided to invite two of J1’s old college mates to go with J2 and I on what we called a JIM FINN MEMORIAL HUNT as a tribute to our hunting partner. This time the purpose was not only deer hunting but remembering Jim Finn and leaving his ashes in one of his favorite hunting spots. I present a few pictures documenting the trip and hunt. PORT LIONS – Instead of the usual 2 or 3 day stay with J1 in Anchorage prior to the hunt to pack gear and supplies I flew directly to Homer. 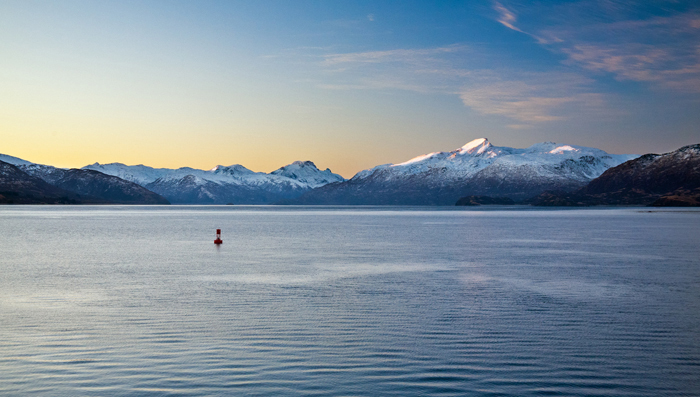 Two days later we jumped on an Alaska state ferry for the overnight trip to Kodiak. The ferry had a dawn stop in Port Lions and this picture captures the view I had at breakfast on ship and at J2’s Homer residence. As a side note, the breakfast aboard ship was great and I had the opportunity to tell the cook so when I bumped into him on deck. I strongly recommend the trip and breakfast. K0DIAK INNER HARBOR – This is a picture of Kodiak inner harbor and part of downtown. We stayed with an acquaintance of Jim’s who runs a B&B. Her husband is the harbor master and told me that the tips of those wind turbines move at something like 200+ mph. Hard to believe as you watch the blades slowly turn. The Church and Fuel Tanks – This picture captures the modern and the old in the town of Kodiak, fuel tanks in the foreground and the Russian Orthodox the Holy Resurrection Church in the background. The Russian Orthodox has a long history in Kodiak and a seminary remains there today. Jim and Dr. Sven Haakenson – Jim had a photo assignment in Kodiak related to the Alaska Purchase Centennial celebration of the purchase of Alaska that occurred in 1967. I tagged along to watch and possibly take pictures of Jim taking pictures. 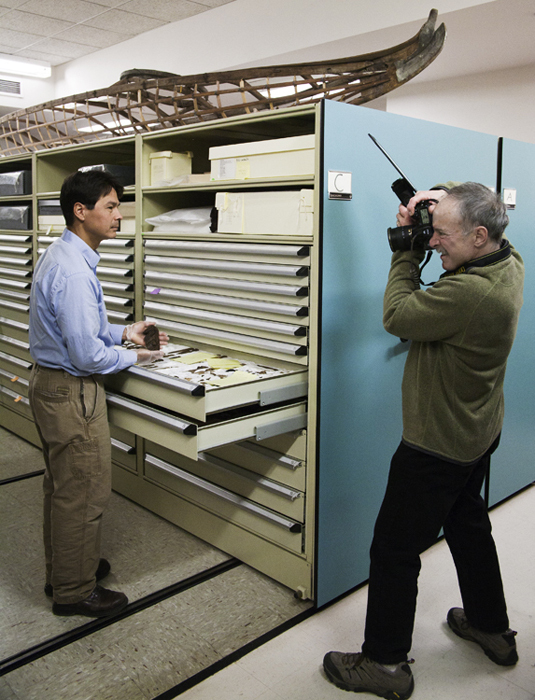 Here Jim is photographing Dr. Haakenson at the Alutiiq Museum, one of two museums in Kodiak and I recommend a visit to both. Jay and King Crab Pots – For three days I had the opportunity to wonder around looking for my own photographic subjects. I was wondering around with Jay Carlon, one of our hunting partners on this trip, and found these king crab pots. Jay isn’t exactly short and he gives you some feeling for how large these pots are; something like 8ftx8ftx3ft and weighing 600-800 lbs. 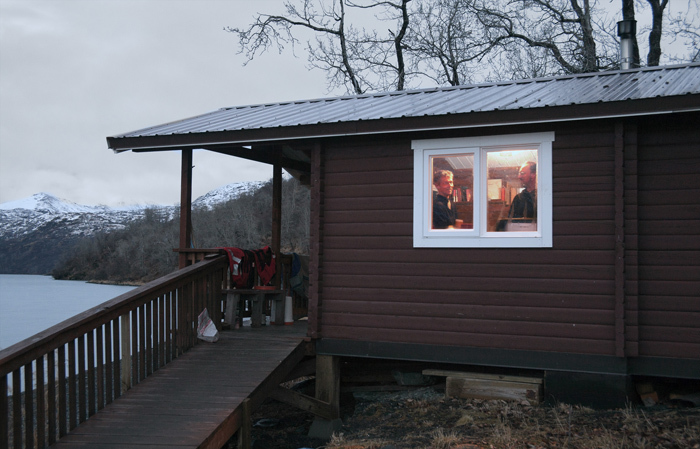 The Transportation – We rented a cabin located along the shore of Uganik Lake within the Kodiak Wildlife Refuge. We took a plane flown by Andrew Airways as we have done so for some 15 years. In Alaska there is an old proverb “There are old pilots and bold pilots but no old bold pilots.” Needless to say, we trust their judgment when it comes to flying around Kodiak. 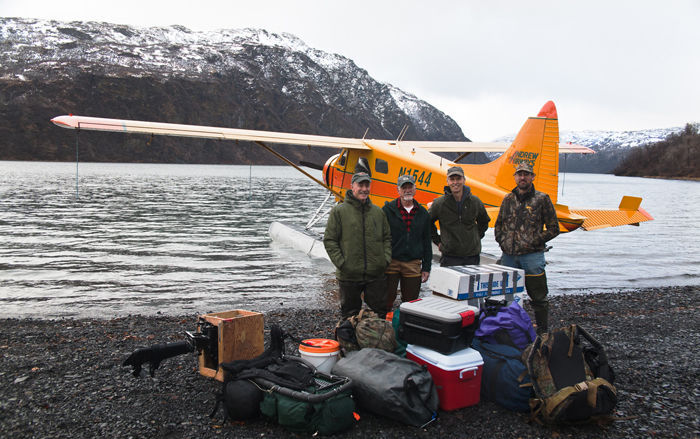 Unloaded Gear and Players – The players in the hunt were (l to r), Jim, myself, Steve Fleishman, and Jay Carlon. Low clouds and fog delayed our flight by only one day and we felt lucky. Last year weather prevented our departure to Uganik by 2 days and back to Kodiak by 3 days. It took two trips to get us, our gear, and food to the lake. Needless to say there is no living off the land for us. The Cabin – This is the cabin we had for a week and a hint of the country we hunt. The clouds were low the next day and then it snowed for two more. That doesn’t prevent hunting. However, it is just not as beautiful as when the sun is out. Testing the Raft – The skies finally cleared and Jim’s raft was inflated and checked out to go down the lake a mile or so to take J1’s ashes down to the valley he liked so much. The motor blew an oil seal so it took muscle power to accomplish our goal. Jim paddled us down there and back. I wanted to paddle to get some upper body exercise but Jim refused to give up the control of the paddles. I came to the conclusion he has some control issues and likes playing Captain Bligh. Fishing the Day Before Departure – A day or two before we were scheduled to depart and after Jim got his three deer he started fishing. 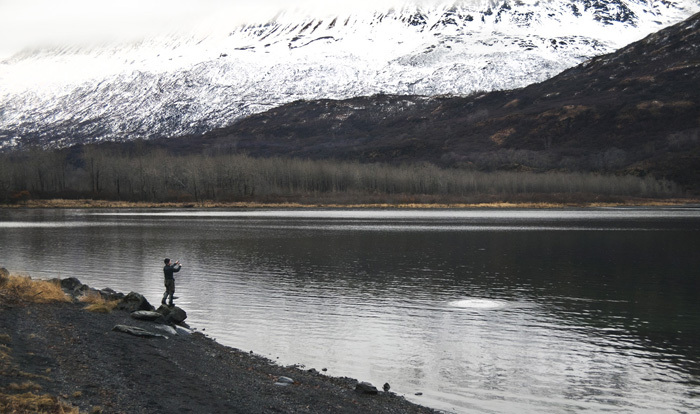 You can always catch Dolly Varden (for those who don’t know their northern fish, it is a salmonid) in the lake. 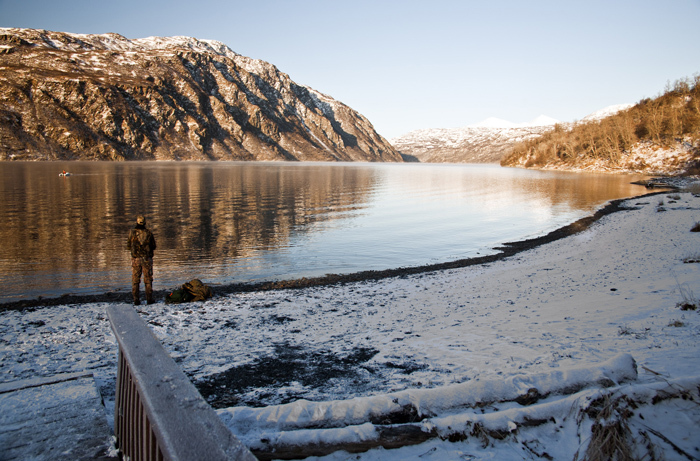 If one arrives several weeks earlier spawned-out coho salmon can also be caught at the mouth of Uganik River (background in this picture). Of course you will have to fight the brown bears for them. One time I was fishing and not paying much attention when my partner told me to turn around and 100 feet away was a brown bear coming towards me. Needless to say we hopped in the raft and got out of there. The Hero Shot – After several years of not getting a deer I finally bagged one and on the last day. This was interesting for two reasons. First, the winter was severe leading to high winter mortality and low population numbers. Second, I’ve never believed that you could bring a deer in by using a deer call. This deer was about 150 yards away on the next hill and I couldn’t get a shot through the brush and trees. I used the doe call and it ran down the hill to about 50 yards below me and walked around looking for, I assume, a doe since it was rutting season. I am now a believer. 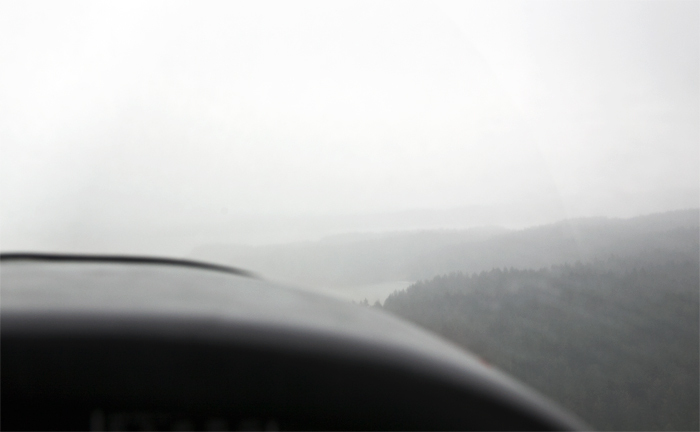 The Flight – We didn’t think we would be getting out, the clouds were low and it was foggy. The flight, which is usually a beautiful one of some 30 minutes over inlets and snow capped mountains, was the longest flight back to town I have experienced. 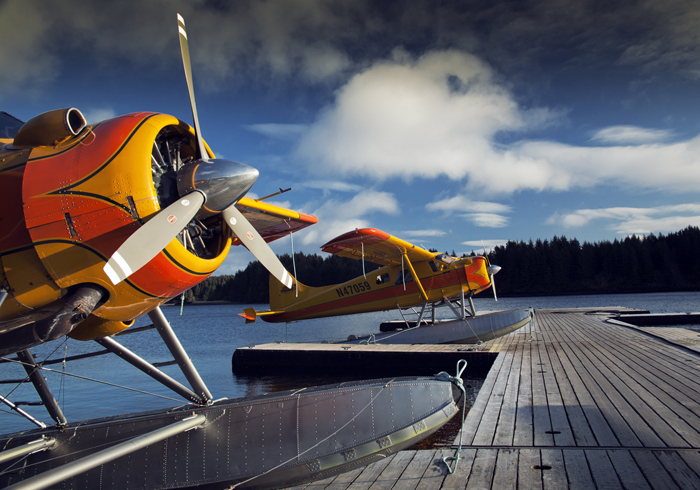 We flew in foggy conditions along Kodiak Island’s shore line all the way to Kodiak City.